Situated in eastern Africa, Ethiopia (formerly called Abyssinia) has an area of approximately 1,127,127 square kilometers (435,186 square miles). 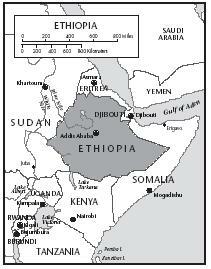 Comparatively, the area occupied by Ethiopia is slightly less than twice the size of the state of Texas. Ethiopia is a country of geographic contrasts, varying from as much as 125 meters (410 feet) below sea level in the Denakil depression to more than 4,600 meters (15,000 feet) above sea level in the mountainous regions. It contains a variety of distinct topographical zones: the Great Rift Valley runs the entire length of the country northeast-southwest; the Ethiopian Highlands are marked by mountain ranges; the Somali Plateau (Ogaden) covers the entire southeastern section of the country; and the Denakil Desert reaches to the Red Sea and the coastal foothills of Eritrea. Ethiopia's largest lake, Lake T'ana, is the source of the Blue Nile River. The central plateau has a moderate climate with minimal seasonal temperature variation. The mean minimum during the coldest season is 6°c (43°f), while the mean maximum rarely exceeds 26°c (79°f). Temperature variations in the lowlands are much greater, and the heat in the desert and Red Sea coastal areas is extreme, with occasional highs of 60°c (140°f). Ethiopia was under Italian military control for a period (1935–46) when Benito Mussolini (1883–1945) was in power. Except for that time, Ethiopian culture has been influenced very little by other countries. Ethiopia's mountainous terrain prevented its neighbors from exercising much influence over the country and its customs. Exotic spices were introduced to Ethiopian cooking by traders traveling the trade routes between Europe and the Far East. Ethiopian cooking is very spicy. In addition to flavoring the food, the spices also help to preserve meat in a country where refrigeration is rare. Berbere (pronounced bare-BARE-ee) is the name of the special spicy paste that Ethiopians use to preserve and flavor foods. According to Ethiopian culture, the woman with the best berbere has the best chance to win a good husband. Mix the garlic powder, spices, and butter together to make a spread. Spread a thin layer over a piece of flat bread. Place the bread on a cookie sheet, and bake for about 20 minutes, until crispy. Measure the ginger, cardamom, coriander, fenugreek seeds, nutmeg, cloves, cinnamon, and allspice into a large frying pan. Toast the spices over medium-high heat for 1 minute, shaking the pan or stirring with a wooden spoon constantly. Put the spices, onions, garlic, salt, and vinegar in a blender and mix at high speed until the spices form a paste. Toast the paprika, red pepper flakes, and black pepper in the large frying pan for 1 minute, stirring constantly. Add the water slowly to the pan, then add the vegetable oil. Put the blender mixture into the pan as well, and cook everything together for 15 minutes stirring constantly. Place the paste in a jar and refrigerate. Melt the butter in a heavy saucepan over moderate heat. Bring the butter up to a light boil. When the surface is covered with a white foam, stir in the remaining ingredients, including the onion and garlic. Reduce the heat to low and cook uncovered for about 45 minutes. Do not stir again. Milk solids will form in the bottom of the pan and they should cook until they are golden brown. The butter will be clear. Strain the mixture through several layers of cheesecloth placed in a strainer. Discard the milk solids left in the cheesecloth. Serve on toast, crackers, or use in cooking. Store the spiced butter in a jar, covered, in the refrigerator (where it can keep up to 3 months). The national dish of Ethiopia is wot , a spicy stew. Wot may be made from beef, lamb, chicken, goat, or even lentils or chickpeas, but it always contains spicy berbere . Alecha is a less-spicy stew seasoned with green ginger. For most Ethiopians, who are either Orthodox Christian or Muslim, eating pork is forbidden. Ethiopian food is eaten with the hands, using pieces of a type of flat bread called injera. Diners tear off a piece of injera , and then use it to scoop up or pinch off mouthfuls of food from a large shared platter. A soft white cheese called lab is popular. Although Ethiopians rarely use sugar in their cooking, honey is occasionally used as a sweetener. An Ethiopian treat is injera wrapped around a slab of fresh honeycomb with young honeybee grubs still inside. Injera is usually made from teff, a kind of grain grown in Ethiopia. The bread dough is fermented for several days in a process similar to that used to make sourdough bread. Usually enough bread is made at one time for three days. Little fried snacks called dabo kolo are also popular. Mix buckwheat pancake mix, all-purpose flour, salt, and baking powder together in a medium bowl. Add egg and club soda, and stir with a wooden spoon to combine. Melt about 1 Tablespoon of the butter in a skillet until bubbly. Pour in about 2 Tablespoons of batter and cook for 2 minutes on each side until the bread is golden brown on both sides. Remove the bread from the pan carefully to a plate. Repeat, stacking the finished loaves on the plate to cool. 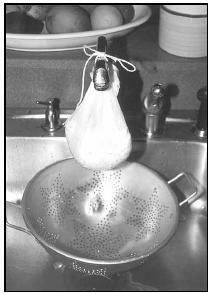 The lab mixture, held in a cheesecloth sack and hung from the faucet, should drain for several hours. Place a clean piece of cheesecloth (or a very clean dishtowel) in a colander and pour mixture into the colander to drain off extra liquid. Gather the cheesecloth to make a sack and tie it with clean string or thread. Allow to drain for several hours until the mixture has the consistency of soft cream cheese. Serve with crackers or injera. Melt the niter kebbeh in a large frying pan. Add onions, green pepper, chili powder, ginger, garlic, and cardamom, and cook for 2 minutes while stirring. Add lemon juice, berbere , and salt. Stir in raw beef and serve. Add water slowly to create a stiff dough. Pull off pieces of dough to fit on the palm of the hand. Press or roll out (using a rolling pin) into a strip about ½-inch thick on a floured countertop. Cut the strip into squares ½-inch by ½-inch. Cook in a frying pan on medium heat until light brown in color on all sides. About half of the Ethiopian population is Orthodox Christian. During Lent, the forty days preceding the Christian holiday of Easter, Orthodox Christians are prohibited from eating any animal products (no meat, cheese, milk, or butter). Instead they eat dishes made from beans, lentils, and chick peas called mitin shiro that is a mixture of beans and berbere . This is made with lentils, peas, field peas, chick peas, and peanuts. The beans are boiled, roasted, ground, and combined with berbere . This mixture is made into a vegetarian wot by adding vegetable oil and then is shaped like a fish or an egg; it is eaten cold. A vegetable alecha may also be eaten during Lent. During festive times such as marriage feasts, kwalima , a kind of beef sausage, is eaten. This sausage is made with beef, onions, pepper, ginger, cumin, basil, cardamom, cinnamon, cloves, and tumeric. It is smoked and dried. Pour ¼ cup oil into a large pot and place over medium heat. Add onion and cook, stirring often, until the onion is golden brown. Add ¾ cup oil and add all other ingredients. Cook over medium heat until the vegetables are tender. Serve with injera made with vegetable oil instead of butter. berbere . A paste, composed of hot spices, used to season many foods. kitfo . Raw beef dish. wot . Spicy stews. If a dish has "wot" in its name, it will be hot, while "alecha" means mild. Before eating a meal Ethiopians wash their hands under water poured from a pitcher into a basin. Then a prayer or grace is said. An appetizer of a bowl of curds and whey may be served. At the start of the meal, injera is layered directly on a round, woven basket table called a mesob . Different kinds of stews such as wot (spicy) and alecha (mild) are arranged on top of the injera . 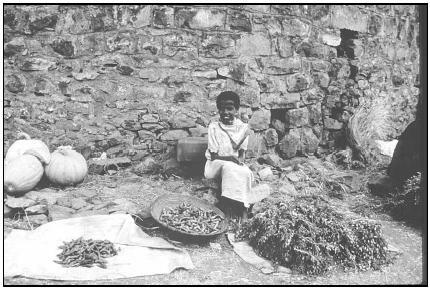 An Ethiopian boy displays the produce, including peppers, squash, and grains, his family is offering for sale in the central market. Sometimes the meal will not begin until the head of the household or guest of honor tears off a piece of bread for each person at the table. The right hand is used to pick up a piece of injera , wrap some meat and vegetables inside, and eat. As a sign of respect, an Ethiopian may find the best piece of food on the table and put it in their guest's mouth. Ethiopians drink tej (a honey wine) and tella (beer) with their meals. Coffee, however, the most popular beverage in the country, is usually drunk at the end of a meal. Ethiopia is considered the birthplace of coffee. Coffee is a principal export. The coffee, or buna, ceremony begins by throwing some freshly cut grasses in one corner of the room. Incense is lit in this corner next to a charcoal burner, where charcoal is glowing and ready to roast the coffee. All the guests watch while the raw green coffee beans are roasted. The host shakes the roasting pan to keep the beans from scorching and to release the wonderful aroma of the beans. The beans are then ground with a mortar and pestle (a bowl and pounding tool). A pot is filled with water, the fresh ground coffee is added, and the pot is placed on the charcoal burner until the water boils. The coffee is then served, often with a sprig of rue (a bitter-tasting herb with a small yellow flower). The same grounds may be used for two more rounds of coffee. Approximately half of the population of Ethiopia is classified as undernourished by the World Bank. This means they do not receive adequate nutrition in their diet. Of children under the age of five, about 48 percent are underweight, and nearly 64 percent are stunted (short for their age). Wars, drought, political unrest, and population pressures of the 1970s and early 1980s have left their mark on the health of Ethiopians. Hundreds of thousands of people died during a famine (widespread food shortage) in 1973, and as many as one million may have died between 1983 and 1985. Ethiopia's coffee farmers produce one of the largest coffee crops in Africa; however, food crops are mainly produced by small farmers, known as subsistence farmers, who attempt to grow just enough food to feed their family. These farmers are not as successful. Ethiopians continues to suffer from malnutrition and a general lack of food. Sanitation (toilets and sewers to carry away human waste) is a problem as well, with only one-fifth of the population having access to adequate sanitation. Between 1994 and 1995, a little over one-quarter had access to safe drinking water. Amin, Mohamed. Spectrum Guide to Ethiopia. New York: Interlink Publishing Group, Inc., 2000. Harris, Jessica B. The Africa Cookbook: Tastes of a Continent. New York: Simon & Schuster, 1998. Merson, Annette. African Cookery. Nashville, TN: Winston-Derek Publishers, Inc., 1987. Sandler, Bea. The African Cookbook . New York: First Carol Publishing Group, 1983. Ethiopian Resources. [Online] Available http://www.ethiopianresources.com (accessed February 28, 2001). IWon. 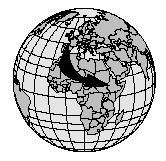 [Online] Available http://advertise.iwon.com/home/food_n_drink/globaldest_overview/0,15463,250,00.html (accessed March 23, 2001). Lonely Planet. [Online] Available http://www.lonelyplanet.com/destinations/africa/ethiopia/culture.htm (accessed March 23, 2001). Spiced Butter Recipe. [Online] Available http://www.wube.net/butter.html (accessed June 13, 2001). World Gourmet. [Online] Available http://www.globalgourmet.com/destinations/ethiopia/ethiback.html (accessed March 23, 2001). It is a doggy recipe,like poaching the chicken and adding tomato puree to the chicken stew (doro wot ), also adding green pepper,onion, lemon juice etc. on kitfo (spiced raw beef) Please don't spoil our national dish/ the person who design/ copy the menu should refer to authentic Ethiopian dish recipe.